What a great topic, Colloidal Silver immune support! When we were learning why ionic silver in particular was an immune system builder, it dawned on us that silver hydrosol gets the job done in a way that is different from the built-in immune system in the body. When consuming Colloidal Silver, it is as though you have two immune systems...the one the body has and the one added by Colloidal Silver! For example, we are all familiar with having a fever. It is well known that having a fever is the body's way of killing off pathogens by essentially cooking them with a high enough temperature. It's actually not to our benefit to stop the fever unless, of course, the temp is becoming too high to be safe. In general, too many folks use medication to stop a fever not understanding that the fever is there to serve them. It's a natural defense mechanism. But the point is that the body uses heat to kill pathogens. Of course, white blood cells are also part of this system, devouring pathogens. We have all heard of white blood cell counts being high when someone is fighting an infection. 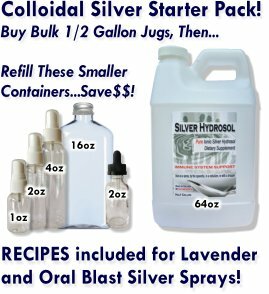 Colloidal Silver support of the immune system is thought to be that it kills pathogens by suffocating them, blocking its oxygen metabolism enzyme that is necessary for the survival of the bacteria, virus, or fungus. Regular antibiotics kill the good and the bad, requiring the user to take probiotics to rebuild levels of good bacteria in the gut, e.g..
How Can I Use Colloidal Silver For Immune System Support? It's easy to support your immune system! On a daily basis, simply take 3 teaspoons a day. Each teaspoon of 6ppm pure ionic silver contains in excess of 1000 trillion ions....more than all the cells in the body. Before swallowing, swish it around in the mouth for several seconds so that it mixes with your saliva. This allows metalloproteins in the saliva to protect the ions as they make safe passage through the stomach and into the bloodstream. Keep drinking lots and lots of clean water to avoid complications with dehydration. Drink enough to require frequent urination. Listen to your body. When you're shivering, cover up...the body is trying to get the fever going. Shivering is how the body is generating extra heat. If ever in doubt about the fever, call for medical help. If you're coming down with a cold or flu, simply take one teaspoon each waking hour. The ions are said to survive in the body for two hours before being discarded through normal excretion. Silver ions do not accumulate in the body. By taking Colloidal Silver daily, you're decreasing the likelihood of catching the flu or cold since the silver ions will maintain a constant presence, making it difficult for pathogens to get a foothold. 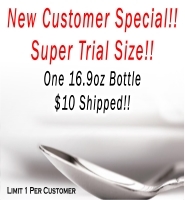 Our 16.9oz bottle is roughly a one month's supply for daily mineral supplementation. When using our ionic silver for fighting a cold or flu, one bottle will last about a week. We recommend always keeping an extra bottle around in case of a cold or flu strikes. No worries about shelf life. The silver ions preserve the product! Is The Herxheimer Reaction Related To Colloidal Silver Immune Support? Yes it is! The Herxheimer Reaction occurs in patients that are given a sudden high dose of antibiotics, causing such a rapid die off of pathogens that the body can't excrete the waste fast enough. This results in flu-like symptoms that can last a couple days or a week or more. It all depends on your state of health at the time of taking the first dose. Since Colloidal Silver is nature's antibiotic with its anti-bacterial, anti-fungal, and anti-viral properties, many customers have shared stories of their Herx event and we have had our own. In fact, it was that detox when Colloidal Silver was new to us that sold us on this potent mineral supplement! We appreciate you taking the time to learn about Colloidal Silver immune support! Please share any stories or questions that you may have! Parents have been told for generations that a high fever can be dangerous to kids. If you don’t get your child’s fever down, you’ll run the risk of frying brain cells, doctors have warned. But now the American Academy of Pediatricians has turned that conventional wisdom on its head. A new report published this month in Pediatrics states that not only is there no need to bring down a fever in an otherwise healthy child, but there is a downside to treating a fever - it can prolong the illness that originally sparked the high temperatures. Sullivan and her colleagues scrutinized studies on fevers and found that there was no evidence that a fever by itself could harm a child – unless the child was under the age of 3 months or had heart problems. In fact, the researchers determined that bringing fevers down could actually prolong illness. That’s because fevers are one of the body’s lines of defense against viruses, Sullivan explained.